MUMBAI (Bloomberg) -- Jaguar Land Rover became the latest casualty of a slowdown in Chinese auto demand, reporting its steepest drop in quarterly profit in two years after retail deliveries slumped in the world's largest vehicle market. Profit fell 33 percent to 302 million pounds ($465 million) in the three months ended March, the biggest decline since the quarter ended March 2013. That contributed to a worse-than-estimated drop in earnings at its parent, India's Tata Motors, which also faced a prolonged slump in demand for commercial vehicles in its home market. The result underscores the reliance of global automakers on China to drive profit growth and the extent of the slowdown in luxury demand after the government's campaign to stamp out graft and extravagance. Jaguar Land Rover said the introduction of new models and conditions in China and Russia may lead to lower Ebitda margins, or earnings before interest, taxes, depreciation and amortization relative to sales, this year. "We see a certain slowdown in the [China] market and we read that many competitors are going to reduce prices," Ralf Speth, CEO of Jaguar Land Rover, said on a call with investors on Tuesday. "I can assure you that we will not be the very first ones to reduce prices because we're convinced we bring color to the Chinese market." JLR began selling the locally built Range Rover Evoque in China in February. "It's a totally new experience for us to be in China," Speth said. "Nevertheless, we are cautiously optimistic that together with our joint venture partner, we will grow our business and market share in China." Jaguar Land Rover's retail sales volume declined in the quarter, with deliveries in China falling 20 percent to 23,526 vehicles, versus a 36 percent increase in the year-ago quarter. The unit's revenue increased 8.9 percent to 5.83 billion pounds. Operating margin rose 200 basis points to 17.4 percent due to a more profitable product mix. The company is seeing a changing Chinese market with more pricing pressure in more segments than in the past, Jaguar Land Rover Chief Financial Officer Kenneth Gregor said on a separate call. China's slowing economy has prompted BMW to cut production and prices in the country. Intense competition is putting pressure on prices, and the automaker doesn't expect this trend to be reversed in the short term, Friedrich Eichiner, chief financial officer of BMW, said on May 6. JLR's profit fell because of higher depreciation and amortization, and "unfavorable revaluation of foreign currency debt and unrealized hedges that are not eligible for hedge accounting treatment," Tata Motors said. JLR plans to spend as much as 3.8 billion pounds in the year started April 1, Vijay Somaiya, head of treasury, said on Tuesday. 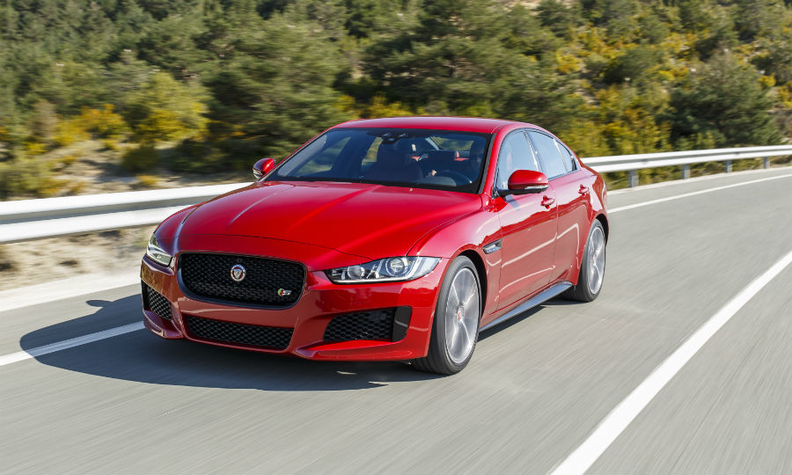 Underpinned by new vehicles such as the entry-level Jaguar XE sedan and the Discovery Sport from Land Rover, the luxury unit has forecast sales will climb to a record of more than 500,000 vehicles this year from 462,209 last year. Tata Motors' net income fell 56 percent to 17.2 billion rupees ($269 million) in the quarter ended March, from 39.2 billion rupees a year earlier. Revenue rose 3.5 percent in the quarter to 675.8 billion rupees. Tata Motors said it won't pay a dividend for the year because of the "continued weak operating environment in the standalone business, and in view of the losses."